Trevecca University is committed to offering competitive graduate degrees that are relevant to today’s global business marketplace. Earn your Master of Science in Instructional Design & Technology fully online and help improve training and instruction in your chosen industry. Currently, more than 130,000 Instructional Design positions exist in the United States, with an estimated 30,000 more positions to be added by 2018. Become an asset in any company or organization by learning skills such as programming, animation/simulation, methods of training and course delivery and designing effective instruction. From building educational courses to training seminars for the workplace, the Instructional Design & Technology degree applies across industry—schools and universities, banking, health care, government, etc. With a master’s degree in Instructional Design & Technology, you’ll learn how to incorporate education/training and technology to better your organization. With Trevecca’s multi-faceted program, our team of credentialed and qualified faculty will work directly with you to start building a portfolio from day one, giving you a competitive edge in a growing job market. This 10 course, 30-credit hour program can be completed in as little as 15 months. The Instructional Design & Technology program allows students to improve the learning environment from classrooms to boardrooms. This 30-hour master’s program teaches key strategy and skills that can be applied immediately in your company or organization. Take the leap today, and start implementing more efficient delivery of training and education in your workplace! Like what you see? Want to learn more? Fill out the form to the right to be connected with an admissions representative! Course is an introduction to the instructional design process with a focus on developing instructional goals, objectives and assessment outcomes. Learners will investigate the various elements that should be considered in the design process such as: needs assessment, common instructional problems, learner characteristics, task analysis, content sequencing, instructional strategies, instructional delivery, evaluation instruments, instructional resources (media selection), formative evaluation, and summative evaluation. Course will teach the basics of copyright laws, fair use guidelines, and ADA compliance regulations relevant to the design process. Learners will investigate the idea of intellectual property as it applies to businesses and organizations. The goal is to provide learners with a practical framework for analyzing copyright issues that they encounter in their professional work. This course will use real life examples—some of them quite complex—to help learners get used to the systematic analysis of copyright problems in course design. This course is intentionally a step toward bridging the gulf that is often perceived between desirable educational practice and legal permissible activities. Course is designed to examine how technology can facilitate instructional practices. Students will explore instructional software, online resources, and synchronous and asynchronous methods in technology mediation. Learners will study variables that affect adult learning, techniques for stimulating and sustaining student motivation, and how to reinforce learning to a global audience. Course involves the exploration of games and simulations. This includes the evaluation, design, and infusion of games and simulations in instructional settings. Students will create a process for using multimedia and visual basic applications for developing instructional materials, presentations, and games. Course provides an application of instructional design principles for the creation of computer-based instruction; emphasis on use of authoring and scripting systems to create instructional software. Course examines the project management phase of the instructional design process. Learners will develop a plan and work in teams to complete “real world” projects that will include a template for design of a specific environment. Course provides an opportunity to apply various learning principles into practice in online design. Students have an opportunity to investigate their faith in which learning design takes place, considering the interplay between content experts or subject matter experts and design methodology. Course focuses on the design and development of various forms of interactive instructional media to support learning. This course will provide experiences in investigating, designing, developing and integrating a variety of interactive instructional media and mobile devices. Course will focus on the effective course/program evaluation and assessment methods, theories, and applications in instructional design and technology. Couse will demonstrate the mastery of content through a practicum or significant project adapted to the professional requirements of instructional design. After a thorough process of feedback and revision, students are required to present their final ePortfolios or build a course to showcase their work and demonstrate achievement of program competencies. Across industries, employers are seeking instructional designers like you to equip their teams with the tools needed to succeed in today's increasingly digital workforce. Trevecca will prepare you to design, develop, and implement the materials employers are looking for, giving you the competitive edge you need to land the career you want. From e-learning to security, there is a career in instructional design waiting for you. 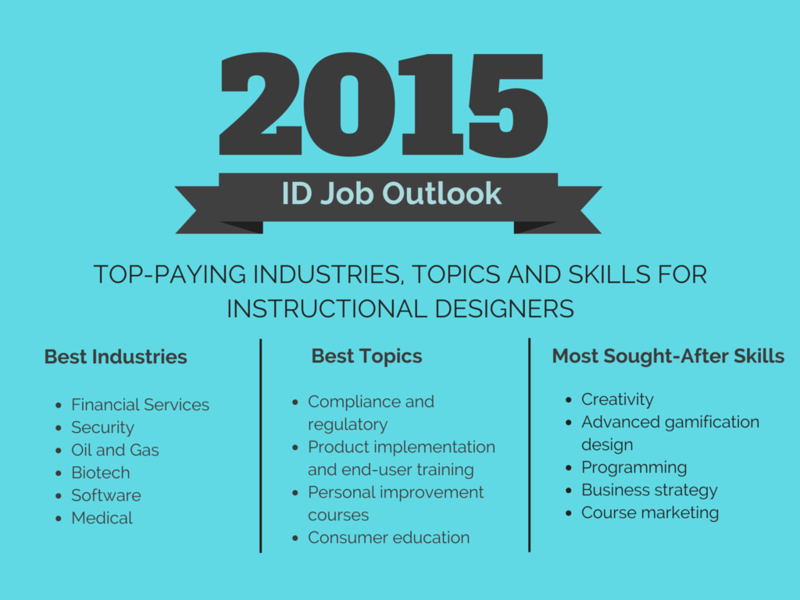 According to Digital Wits, 2015 saw these top paying industries, topics, and skills for instructional designers. Instructional Developer: Identify target audience's needs and create engaging learning activities and compelling course content that enhances retention and transfer. Instructional Designer: Design and develop curriculum content, training materials, modules, and teaching aids while mangaging curriculum development programs. ELearning Designer: Design engaging learning and development solutions to meet web-based learning needs. Technical Training Specialist: Identify training needs or gaps and develop dynamic solutions for them including security awareness, eLearning, video, instructor-led content, virtual classroom design, tool kits, and study guides. Product Developer: Lead multiple projects to identify and develop innovative products for future commercialization. Since 1901, Trevecca Nazarene University has been dedicated to bringing Nashville students an unmatched education through exceptional teaching. Now the same education is available anytime, anywhere through Trevecca Online, allowing you to receive the education you want with the flexibility you need. When you choose Trevecca's M.S. in Instructional Design and Technology, you choose a community of instructors who are committed to training a class of business professionals to fill a growing need in the business marketplace. Trevecca's holistic approach to instruction will provide you with a comprehensive understanding of how to be an effective developer, designer, or trainer in your chosen field. How is this program taught? Projects? Papers? Recorded teacher videos? This program is taught using a variety of platforms, which include videos, e-books, textbooks, links, animation, and recordings. We want to ensure that we use as many platforms as possible to help every student learn. The program is project-based and you’ll be putting your knowledge into practice. Wwhen the program is done, you will have completed a project on your own and will be ready to hit the ground running in whatever job you take! Any programs needed for this degree will be provided for you, so there’s no additional cost to you! What if I don’t have a math course with a C grade or better? / What if my GPA isn’t at 2.75 or better? Send us a copy of your official undergraduate transcripts, and any graduate transcripts, if applicable, and a copy of your resume and we’ll see what we can do to help! We want you to be a successful student at Trevecca, and will see what can be done to best serve you.